After the darkness is gone. I have always felt inspired when I see this little stand of trees. This morning the sun highlighted their hopefulness. So good to be painting again. I have painted this spot many times and it never fails to bring me pleasure. Shadows and atmospheric perspective have fun with color value, temperature and tint. Good to get to the easel today after a busy day in the office! 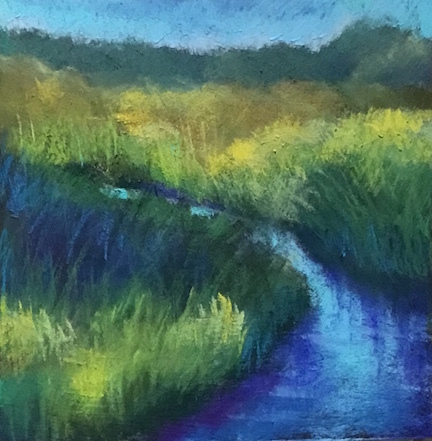 Pastel Painting… beginner and intermediate In this class, participants will experience a nurturing community atmosphere that will ignite artistic and personal growth whether you are a first time explorer or have had some experience. Students in this class will develop basic pastel painting techniques as we seek to discover our own style. We will explore color and composition, while refining our drawing skills. If you don't have materials and would like to use studio materials, the cost is $200. Standing in the brilliant sun trying to paint this glowing barn was very memorable. I had a terrible time choosing colors, but I loved the way the barn seemed to glow. I was almost blinded by the light and couldn't quite get is right. The painting sat in the drawer I call "You've got one more chance!" Today I took the painting out of its exile to give it another chance and get myself warmed up to painting after a two month lapse. It was fun to try to capture the memory of an iridescent spring afternoon. I got my hands dirty and played with my pastels! 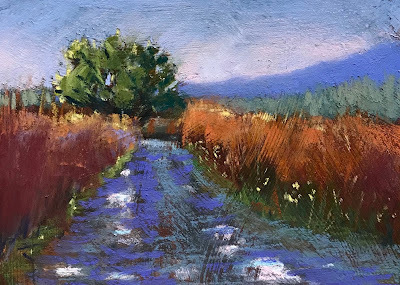 My Pastel Painting class starts on September 17! Come and play!!! It's been quite a while since I used the creative side of my brain to paint! You might know that I started a wonderful new job in July. My job is challenging both sides of my brain, but it feels like I've been away from the easel for too long. Beginning to teach again will be good for me and for you, too, if you can join me! I'm just offering one class this time around, and it begins on September 17th in my studio. 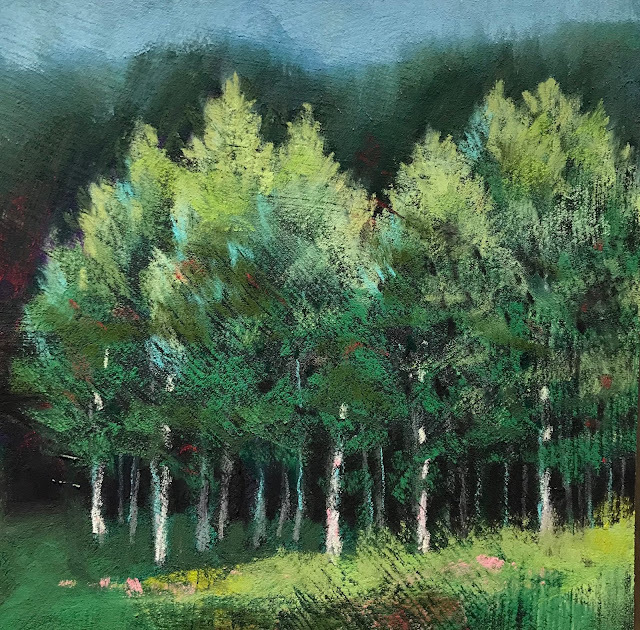 In this class, participants will experience a nurturing community atmosphere that will ignite artistic and personal growth whether you are a first time explorer or have had some experience. 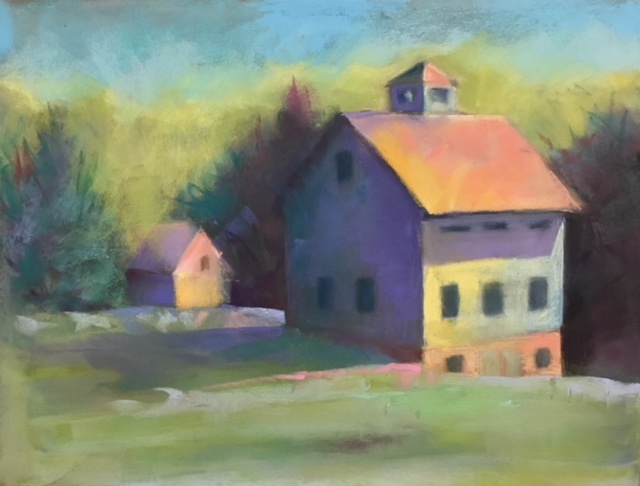 Students in this class will develop basic pastel painting techniques while discovering their own style. We will explore color and composition, while refining our drawing skills.